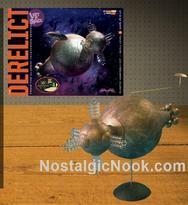 Item #965 Moebius Models-Lost in Space-Derelict Space Ship Model Kit $54.95 ea. In Stock This original model kit of the Lost in Space Derelict ship as seen in the original tv series, is in 1/350th. scale, comes with mini Jupiter 2 ship with the options to be build with landing gear up or down, when assembled is about 17" long, included paper interior details, jaws on ship can be built to be opened or closed, skill level 3, all boxes are sealed and near mint, paint & blue Not included. This Polar Lights original includes Dr. Smith and the B-9 Robot and a planet display base, skill level 2, near mint boxes, still sealed, paint & glue Not included, getting hard to find, out of production. Item #913 Moebuis Models- Lost in Space - Jupiter 2 Model Kit $124.95 ea. In Stock This Moebius Models 18" in diameter Lost in Space- Jupiter 2 model kit, is sealed in near mint box, with over 200 pieces, extremly detailed interior, 1/35th scale, the entire upper hull lifts off to reveal interior, 2 fushion cores, 1 with fins extended, 1 with fins attracted, optional positional landing gear, outlines for Chariot & Space pod hatches, 3rd. season interior, skill level 3, box is 18" X 18" X 5" deep, loads of clear parts for lighting, paint & glue Not included. Item #170 Tin10 Lost in Space Re-production Metal Lunch Box $19.95 ea. In Stock This new Tin10 Lost in Space metal re-production lunch box is mint, still shrink wrapped, and is about 7 1/2" wide X 7" tall X 4" wide, limited to only 5,000 pieces, officially licensed by Irwin Allen productions, art work by Chris White, full color graphics. Item #947 Lost in Space B-9 Robot Retrofit Glass Dome Model Kit $14.95 ea. In Stock Finally a glass dome for the B-9 Robot model kit #939, virtually seamless, estimated thickness is 0.75mm, retrofit kit is for the person who purchased the original kit, but has not started it, in 1:6th. scale, contains instruction update, glass dome and minor plastic parts to add to an unbuilt kit, all boxes are near mint & sealed, skill level 3, paint & glue Not included. Item #948 Lost in Space- B-9 Complete Glass Dome & Head Model Kit $29.95 ea. In Stock Option 2 for those who have built the Robot kit, this set comes with all parts from the collar up to build the entire head. If not built with to much glue, old head can be snapped or razor sawed off and replaced with this new one, 1:6th. scale. for kit #939, all boxes are near mint and sealed, paint & glue Not included, skill level 3. 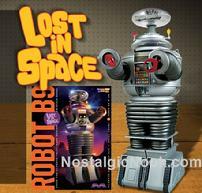 Item #939 Moebuis Models-Lost in Space B-9 Robot Model Kit $54.95 ea. In Stock This B-9 Robot model kit is in 1/6th. scale, when assembled is almost 13" tall, features include soil sampler with opening door, photo-etched side vent screens, detailed power pack and optional retracted arms, all boxes are near mint & sealed, molded in grey & clear parts, extremely detailed, paint & glue Not included, skill level 3. 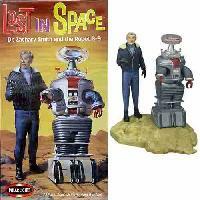 Item #902 Lost in Space- Chariot Re-Issue Model Kit $54.95 ea. In Stock This re-issue Lost in Space- Chariot model kit is the same as the first issue is in 1:24th. scale, all boxes are near mint and sealed, paint and glue NOT included, skill level 3, also includes a mini B-9 Robot, weapons, clear canopy, detailed interior, rubber treads and wheels, extremely detailed, paint & glue Not included.